NEW YORK (WABC) -- Charging your mobile device in the middle of a New York City park is now a reality for some thanks to a new pilot program now underway. 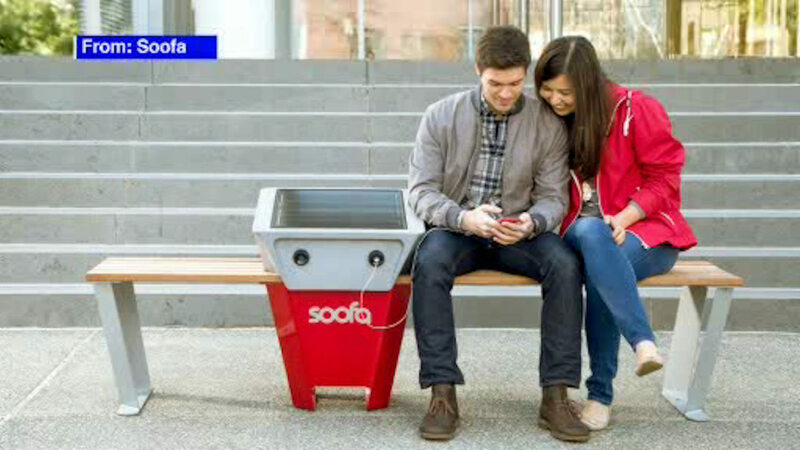 The Parks Department in conjunction with Soofa, an MIT Media Lab spin-off, will place five solar powered benches that will provide free mobile device charging in parks in Manhattan and the Bronx. NYC Parks Commissioner Mitchell Silver, Council Speaker Melissa Mark-Viverito, Chief Technology Officer for the City of New York Minerva Tantoco, and others were on hand at the Parks Without Borders summit at The New School on Tuesday to make the announcement. "These Soofa benches will provide a look forward into the future of parks," said Commissioner Silver. "We know just how valuable the use of technology is and how important it is in our day-to-day experience - and these benches tap into that power by allowing us to measure park usership and engagement while protecting parkgoers privacy and providing a vital service." The first bench was installed Tuesday in Highbridge Park in the Bronx, with the remaining four scheduled for installation next month in Manhattan. "The Smart Bench program is another example of New York City leading the nation with sustainable innovations that contribute to a greener and more livable urban environment," said Council Speaker Mark-Viverito. "This initiative will provide two vital amenities in our city parks: solar power and internet access. The Council has been a strong advocate for Wi-Fi in parks, and is committed to providing streamlined, inclusive digital services to diverse communities throughout the City. I applaud the Administration and Soofa for this forward-thinking project." The smart benches will also be used to track how many people use the parks in which they're installed through their Wi-Fi enabled devices.